Worried that Apple or Google might grab your photos or contact info, in view of recent revelations that certain apps on the iPhone or Android-based mobiles can? 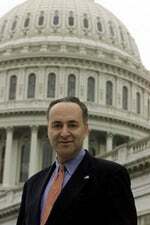 So is Senator Chuck Schumer (D-NY). He's so worried, in fact, that he's calling for a federal probe into whether grabbing personal information without your authorization amounts to "an unfair or deceptive trade practice." A report that specific phone apps could do precisely that (and in fact were) surfaced in late February when the New York Times outed an iOS glitch that gave developers all-you-can-eat access to iPhone, iPad and iPod Touch users' video and photo libraries. The kicker: Despite Apple policies prohibiting info grabs without user consent, users weren't being notified that their data was being taken. That, says Schumer, is tantamount to theft. "When someone takes a private photo, on a private cell phone, it should remain just that: private,” said Schumer in a statement. “Smartphone developers have an obligation to protect the private content of their users and not allow them to be veritable treasure troves of private, personal information that can then be uploaded and distributed without the consumer’s consent." Schumer says the notion that this could happen "sends shivers up [his] spine," and argues that "[if] the technology exists to open the door to this kind of privacy invasion, then surely technology exists to close it." He draws an old-tech analogy, too, reasoning that "[when] a consumer makes a private phone call or sends a letter the old fashioned way, they have a very reasonable expectation that the communication is private … The same standard must apply to our new technologies, too." What's more, argues Schumer, where companies like Apple and Google already have policies in place prohibiting the illicit taking of user information, it's incumbent on them to enforce those policies. "I hope [the FTC] will consider launching a comprehensive investigation to explicitly determine whether copying or distributing personal information from smart phones, without a user’s consent, constitutes an unfair or deceptive trade practice," concludes Schumer, adding that he wants there to be a requirement that smartphone makers put safety measures in place to essentially make it impossible for developers to grab stuff without our consent. Schumer has a point: None of the apps I've downloaded on my iPhone have asked my permission to access this kind of private data. All I see I grab something is Apple's "this app would like to send you push notifications" prompt at launch. What's needed is a switch (ideally, under a settings "privacy" category, something iOS currently lacks) that allows you to lock up all of your personal/volatile data — enabled by default — as well as the option to configure app by app, if you want info-sharing enabled for some apps but not others.